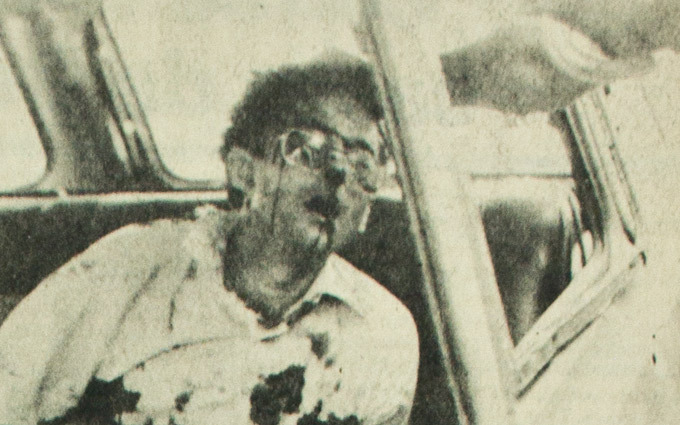 It is Saturday, 14th February 1981, around 13 pm, Dr. João Crysóstomo de Oliveira Campos, who was the police chief of São José dos Campos City, called Dr. Mário Ottoboni, and visibly moved, he asked him to go together with Dr. Franz de castro, to the police office of Jacareí City, where there was a prison rebellion. He was warried because the prisioners held three police men at the sight of a gun, threatening to kill them if they would not cooperate with them for the success of their escape. 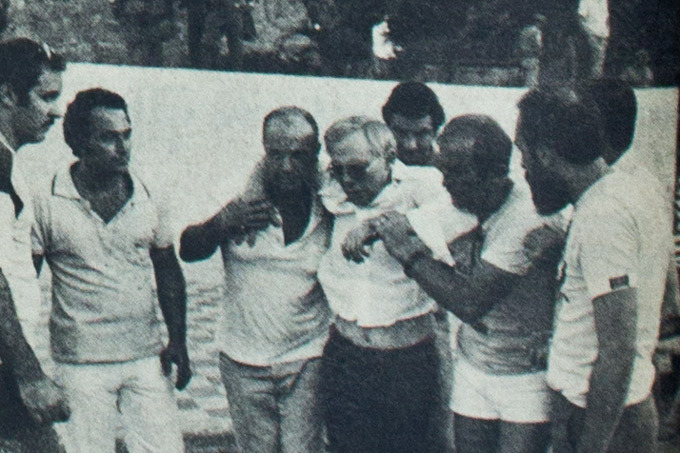 In the opportunity, in the Fire Department of Jacareí City, there was the Judge of that city called Orlando Pistorezzi, who was coordinating the liberation of the hostages. After the arrival of Dr. Mario Ottoboni e Dr. Franz de Castro, who were willing to mediate the situation in order to have a happy end, they met with the Judge Orlando who called the Police Department and anounced to the leader of the rebellion that their requirements would be accepted. He explained to them that there was the presence of Franz e Mário, and the prisioners would leave the place in two groups without problems. At this moment, the Mayor of Jacareí, called Mr. Benedito Sérgio Lecione, gave to them the official city car so that they could take it as their transport. All authorities gave their word that the prisioners and the hostages would leave the place without any problems and hostilities. 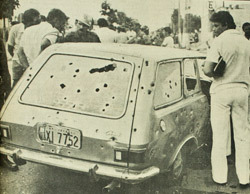 The first group left the place in company of Dr. Mário Ottoboni, who drove the car together with two hostages. The work was successful with the return of Dr. Mário and the who hostages. Franz de Castro remained in the local, together with a police man who was a hostage and some other prisioners. How the situation worsened with the eminent risk of a terrible end, and how nobody would volunter to take the second car for the other prisioners, Mário Ottoboni, although with serious risks of life, volunter to take the car, Belina model, but the police required that they would free the hostage and take Franz de Castro in his place. In that way, Franz ceased to be the mediator and became the hostage. How Franz de Castro was not a driver, one of the rioting prisioners got the task to drive the car. The prisioners gave the hostage do Mário Ottoboni in exchange for the Belica key. Dr. Mário Ottoboni left the firing line with the hostage. When the prisioner was getting in the car to drive it the police started shooting and was executed although he stood his hands as sing of peace. Franz and the other prisioners were already insite the car. Sudenly, an inexplicable and intense firefight dominated the place, wich resulted in the death of Franz de Castro Holzwarth, by reaching over thirty bullets. All other occupants of the Belina, six prisioners died on the local. In that way was consummated the tragedy that turned the Christian ideal companion, a martyr. Franz de Castro victimized in the shooting of Jacarei. Franz de Castro 's father backed out of the scene of the shooting. In that time, the Bishop of São José dos Campos Diocese, who is a cardeal in our day, called Dom Eusébio Oscar Scheid, Archbishop Emeritus of Rio de Janeiro, had this to say about the episode: "To remember the figure and the attitudes of our martyr friend, awakens in us all the disere to follow his steps in the hard Prison Pastoral. He, who gave the life as proof of bigger love (cf. John 15:13), encourages us, enlightens us and strengthens us in this purpose." Up to now nobody knows the causes of the rebellion. The public jail of Jacareí had 69 prisioners in it, but held place only for 50 people. But the authorities believe that this was not the cause since they were having all they need there. The police chief Juarez said to the press that "they have all insite there. I don´t know why the rebelled."